Hundreds of people marched in a "Muslim Day Parade" Sunday in New York City that was hosted by the Muslim Foundation of America. The parade, an annual event held on the last Sunday in September, is intended to bring together "Muslim-Americans from the five boroughs and beyond, celebrating the rich, cultural traditions of a faith that has provided hope, support, and comfort to generations of New Yorkers." According to its website, the parade "gives all New Yorkers an opportunity to renew their commitment to our city's diverse spiritual community and to commemorate the tremendous contributions of Muslim New Yorkers." There were scores of people marching who seemed to buy into that, with Muslim law enforcement officers marching in uniform and some groups proudly waving American flags. New York City Police Commissioner Ray Kelly made an appearance, seeming to indicate that the city wanted to support its Muslim community. But many used the event to utter political messages. 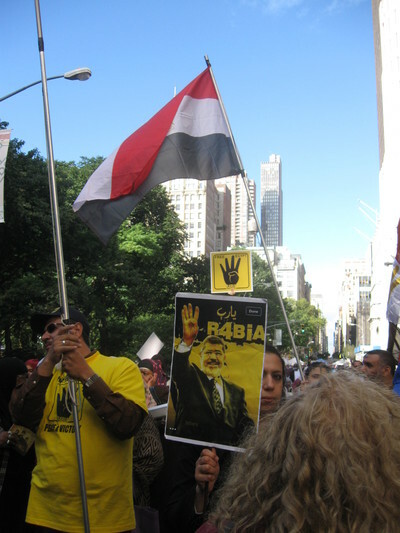 A sizeable contingent carried signs or wore T-shirts with images of ousted Egyptian President Mohamed Morsi and with the "R4bia" logo indicating solidarity with Morsi's Muslim Brotherhood. Morsi was forced from office after an estimated 30 million Egyptians – nearly half the country – took to the streets to protest his year in office. Critics say Morsi was more focused on consolidating power for Islamists than in addressing social and economic crises in the country. Upon closer inspection, an otherwise sweet scene of young children singing about their devotion to Islam, included the toddlers holding up R4rbia's tell-tale hand gesture. Khaled Lamada, a parade trustee and founder of a group – Egyptian Americans for Democracy and Human Rights – which has staged several protests demanding Morsi's return to power, used his speech to drum up support for another upcoming pro-Morsi demonstration. "So I'd like everyone to call our administration to recognize it's a coup," Lamada said. "Don't let the media lie to you, don't let the administration lie to you. It's a coup. The second thing, I would like every free person, American, Muslim and non-Muslim to go out on September 28th in front of the United Nations to say it's a coup and to stop dictators from running countries." More disturbing, the parade somehow managed to incorporate six marchers proudly waving the flag of Jihad. The flag, seen in the video below, is often used as a rallying call for radical Islamists who call for violent battle and the organization of a global caliphate. It is under this banner that so many jihadist attacks have occurred worldwide—including the most recent attack, the multi-day massacre of civilians in a mall in Nairobi, Kenya by the al-Qaida linked militant group Al-Shabaab last weekend. It would have been an encouraging sight at this celebration of diversity and contribution if other Muslims in the parade chastised the minority advocating jihad and theocracy. It's unclear from our experience with the event that such a stand against terror was taken. But it would have been nice, and certainly worthy of commendation. What is the problem with this event? The 'Die Hards' will always oppose, as they are selective in their memories and their Democracies. The six women are carrying flags of 'Faith' (Statement of Faith - as it would be the Crucifix for the Christians), so what is your problem? Was Hamas not 'Elected'? Didn't the 'Hizbollah' defeat the Israeli Army? Get Over It! Parade for interculturality between different nationalities in the united states land.and its object is "to expose" yourself to others and not to menace them.here i talk about the women and men in the above video.to expose youself to others is not to hide your face. Pretty self explanatory with the flags and hand signs meaning total solidarity with the Muslim Brotherhood, which the White House, State Department and Immigration seem to have forgotten that the Brotherhood gave BIRTH TO HAMAS AND HEZBOLLAH---BOTH TERROR ORGANIZATIONS RECOGNIZED BY THE WEST AS SUCH.